I had plans to fish three streams on this day and that mission was accomplished. As I've said many times these outings are more about an outdoor experience then it is about catching fish, and this outing was classic. When I walked down the path to reach stream #1 of the day I found it flowing beautifully. Just hearing it tumble over the rocks gave me a good feeling. As I got to where I would make my first cast I was a little bit shocked. Beavers had made a dam and it totally changed the streams flow, not to mention the mess around the stream which including the loss of a considerable amount of trees. These guys had made a total of three dams along a quarter mile of stream. There has to be something done...after the first of the year I'll contact the land trust to see if they are aware of the damage going on and if they have a plan on correcting it. Well I fished the stream some and had no luck at all. I drove to the second stream and found it looking sweet. I reached the first run and tossed in the fly, result nothing. I fished the entire length of that stream with out a bump. No panic on my end for I knew the trout were there for I spooked many. For some reason they were just not feeding. Finally in this lovely pool I was able to get a fish to take. A 2 hour brookie....well worth the wait. On my way to fish the third stream I pass by a small general store. This place has one of lifes pleasures in the form of coffee. The coffee is roasted and blended locally and brewed perfectly. It was delicious "black and hot". Stream 3, it's actually the same stream as #1 just further up. In this area the stream flows softly and it's pools are long with slight riffles in between. This section has given up some big brookies in the past, but today they were all sleeping. I worked very hard and with a variety of flies but I could not get a take. Not far from where I was to climb up out of the stream to call it a day I managed to get this fellow to take a dry. I was happy for that brookie may have been my last of 2016. When we were kids back in the late 50's we had a summer camp at Hamonassett State Park. It was a large WW2 army tent along with a small pre-fab building. At that time you were able to keep your camp all summer and we so enjoyed those times. We would come home weekends to o laundry a shop for some things you were not able to get along the shore. The route we would take was a two lane highway, and speed limits were 45mph tops, so this made the 50 mile drive quite long. There was a restaurant along the route that was about half-way between home and camp. "The Watering Hole" as it was called. We would stop for a spell and the adults would enjoy a Balentine or Schaffer and us kids had a "Frostie" root beer or a Coke along with a bag of chips. Naturally us kids did away with the refreshments quicker than the adults and so we would head outdoors and explore the area. There was a stream that flowed behind the restaurant and I being a novice angler took interest in it. That's where it ended, I never fished that stream. In the early 70's my son was born, a fishing buddy built into the house. When he was 10 we visited that little stream of my youth, the one I never fished. There was an old broken down bridge that crossed the stream. Looking through the cracks and splits I observed fish moving about. I encouraged my son to drop his line into the pool. As the worm hit the surface a fish rose and took the bait. A few seconds later we were holding a 12" bass. We continued to fish that stream and caught many more fish, bass, chubs, and sunnies. Again we never fished that stream for sometime. Forward to the 90's I said to myself it's time to check that stream again. Was was solid into fly fishing and was curious to see if the stream held some trout. My curiosity was answered in just a few casts. A handsome brown trout was at hand. I found out later that the state had stocked this stream with browns years ago and a few perhaps spawned successfully. Now this little stream has gone "native and wild"...I still fish this stream, and I enjoyed its company along with a few of those "native and wild" jewels that call it home. The stream is so beautiful...though its jagged rocks must be respected. It's pools run deep, and hold willing brook trout. Still faithful after so many years. "Small Stream Reflections" can be seen in this pool. A fly presented just right will yield a beautiful reward. This fellow seemed to approve. May this stream that has been in my life for so many years, continue to be as it is today. We are about a week away from our annual New Years Day fishing meet. This tradition started back in 2010 and has continuous despite some harsh weather. Each year we pick a small stream and gather. Coffee and donuts are served and the day is planned. We then head off to the stream and try to get on the board for the first time in the new year. Around noon we assemble and enjoy a hot lunch, usually home made chicken soup and chili. The afternoon brings another walk to the stream and we continue until it get to cold, with me it's usually the feet. The first outing started with three of us but has grown to six. There may be an addition this year. Below are a series of the New Years Day outing over the years. See you gents in a week.....don't forget to buy your 2017 license. Jeanette and I would like to wish all of you a most wonderful Holiday Season. Be safe and enjoy all that is around you. Kirk and I met up to fish this first day of winter. The time was 9:30am, which was a good choice for it allowed the sun to warm up things and it enabled the brook trout to fully wake up. We moved along the stream and the action was slow. We both fished flies that stayed close to the bottom and the response was poor. An hour into the outing and Kirk had the first fish of the day and suddenly our outlook looked brighter. The stream was free of ice for the most part. Water temp was taken and showed 38 degrees, not prime dry fly action so we thought, but again we were proved wrong. Fishing a really remarkable run we saw multiple fish rising. Not seeing any flies about at first I selected a soft-hackle. I put a bit of floatant on the tippet and just a touch of it on the fly head and sent it off on a drift. It did not drift long before it was noticed and eaten. My first brook trout of the day to hand. The semi-dry soft-hackle.....red silk body and starling hackle. This fly worked real well today. "Winters Reflection" can be seen here....cold and beautiful. These wild native charr are so gracious and beautiful. This run must have held 20 plus fish. They were taken on dries and soft-hackles. This guy still held that awesome color of autumn...as it turned out he was my last fish to hand. And the fly that fooled him....these are a common hatch on winter streams....Alan time for another cup of coffee, you must be dreaming. One of the many Kirk brought to hand. Pretty fish. The seasons can be seen in this photo.....autumn departing, its leaves wrapped in winters icy grasp...the solemn look of the trees as they stand naked. This is the start of the long season. Congrats to the winners, and a big "thank you" to all of you who took part. Mark and Sam I need you to email me at uppahdam@aol.com with your mailing address. More "North Country Flies"...."Waterhen Bloa"
While looking through the pages of Robert Smiths book "The North Country Fly" I came upon an interesting pattern with a funny sounding name. 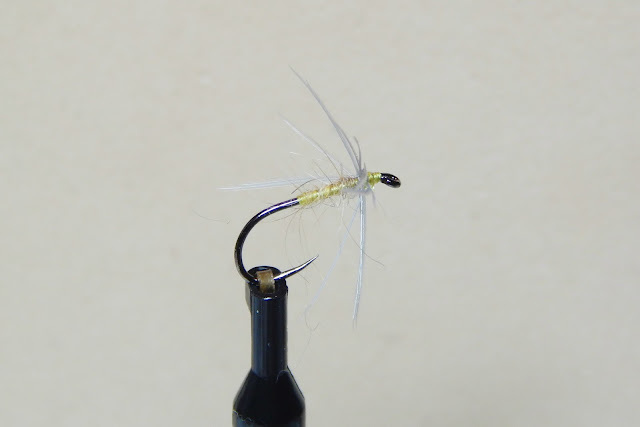 The fly known as the "Waterhen Bloa" looks to be as simple a pattern as I've ever seen. The fly a pattern of Mr. T.E. Pritt, a very well known North Country Angler. I believe the Waterhen Bloa was first tied in 1885. The term "Bloa" refers to the color of which is steely gray. Waterhen is not available to me, but feathers from a California Quail, or hen can be substituted. The body is Pearsall's yellow silk and the dubbing which must be sparse is mole or hare as a substitute. The object is to allow the silk thread to show through. Below are two "Waterhen Bloa" spiders. The first is tied on a Allen 102BL hook, and the second fly is tied on a Partridge classic "spider" hook. To those who visit this blog, and take the time to read it, comment on it and generally fill it with insightful and meaningful words, I have a few gifts to show my appreciation. All you have to do is comment on this post. On the 21st of December at 7am I'll put the names of all who commented in a box and I'll have Jeanette draw the winners. The names of the winners will be posted soon after. Merry Christmas friends. The first gift is a plastic fly box. Double-sided with ample space for enough flies for a day on the water. In the box will be 9 of my soft-hackles including my newest pattern which I have not tested as of yet, but I have high hopes on it. 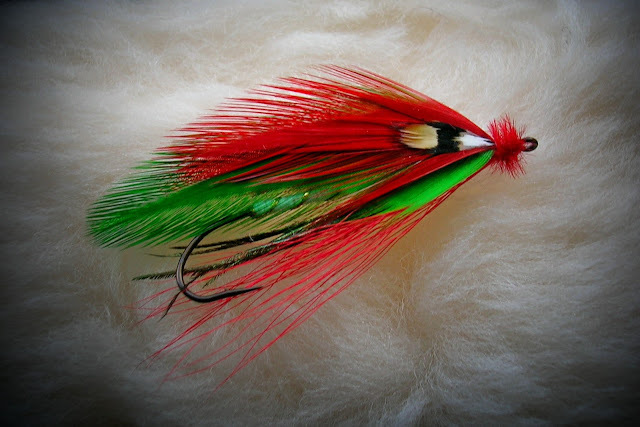 The second gift will be the streamer "Labonte"....Tied in the Rangeley style. In the small stream angling community secrecy is probably the best piece of equipment an angler can possess, and if the stream contains wild brook trout that knowledge would be harder to get from the angler than a secret from the CIA. Tuesday one of those secrets was shared by a fellow small stream addict with myself and Kirk. Rowan from "Connecticut Fly Angler" was gracious enough to show us one of his gems. We chose a place to meet and the time was 9am, which is about an hour before the brookies become active. In winter they love to sleep in and breakfast is when the sun warms the waters. The air the night before was cold and the frost that formed on everything was very picturesque. We got ourselves geared up and a small walk brought us to the stream. Splitting up, Kirk wet downstream and Rowan upstream, and the senior angler was given the easier, kinder access run to fish. The easy access I fished is in the first photo and as it turned out to be my best run of the day. I tied on a "pinkie" which is one of the better flies for winter stream fishing. Several casts were made but not one honest take. What I did notice was that while retrieving the fly several times I saw a slight interest in it as it came to the surface. A look in the fly box and a Stimulator" was plucked from it and tied on. The second cast and my first wild jewel was at hand. Rowan working one of many "fishy" looking runs on this stream. I continued my way downstream, slowly working all of the good trout water. The stimulator still attached. As it turned out that was the only fly I would only need. I tried a few soft-hackles which worked but not like the "stimi". Another Connecticut wild one. These brook trout were strong and well fed. The little 4'10" 2wt was bent pretty good by the brookies in this stream....is that green grass? I never give the names of streams I fish, but in this case I will. The reason I'm going to tell the name is because I believe no one will want to challenge it's defence. So the name of the stream is "Thorn Brook" I have several gashes on my hands and fingers that still throb. These fish are worth bleeding for. Kirk working a good run. This run-pool owes me a giant....I had a beauty on here and lost him. My last jewel of the day....hook barely in has lip. Take a good look at this "buck"...the hooked snout, that kype. the shape of his head as well as the shoulders...this will be an awesome fish come next October. The day was pretty much ended when we stopped for a coffee. Kirk and Rowan fished a few other areas but I chose to go home. Thanks Rowan, and thanks Mr. and Mrs. S. Fontinallis, for a fine day.